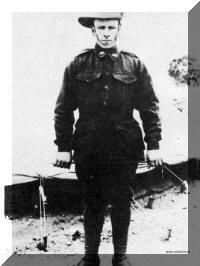 3-Henry Herbert Goss was born on 24 Nov 1888 in Westbury, Tasmania and died on 23 Jul 1956 at age 67. He served in the First World War. Henry married Hazel Daphne Crack, daughter of Walter Raleigh Crack and Mary Margaret Maria Harman, on 8 Oct 1919 in South Spreyton. Hazel was born on 24 Feb 1903 in West Kentish, Tasmania and died on 1 May 1979 at age 76. Henry Herbert Goss (Harry) looked after Elizabeth for a time, but finally enlisted in 1916 and after returning from war service married Hazel Daphne Crack, a local girl, whose parents were Joseph and Mary Margaret Maria Crack, nee Harman. Joseph had been born on the ship which brought his parents from England to Australia. Harry and Hazel spent the whole of their married lives in the Sheffield area, long occupying a house at McGuines' corner in Barrington. Brothers: 2095 Pte Alfred James GOSS, 40th Bn, returned to Australia, 12 May 1919; 3966 Lance Corporal Frank GOSS, 52nd Bn, returned to Australia, 26 September 1917; 6518 Pte George GOSS, 12th Bn, effective abroad (still overseas); 7995 Pte Arthur Ernest GOSS, 12th Bn, returned to Australia, 22 September 1919; 3967 Pte Lambert Gordon GOSS, 1st Pioneer Bn, returned to Australia, 4 May 1917. 5- Shirley Claudette was born on 1 Oct 1943. Shirley married Nigel Winstone Dawkins. Nigel was born on 12 May 1942. They had three children: Michelle Anne, Brett Winstone and Richard Leigh. 6-Michelle Anne Dawkins was born on 14 Oct 1963. 6-Brett Winstone Dawkins was born on 16 Apr 1965. 6-Richard Leigh Dawkins was born on 9 Sep 1966. Olive next married Harold Collins. Harold was born on 28 May 1920. They had one daughter: Cathleen May. 5-Cathleen May Collins was born on 15 Jan 1950. Cathleen married Richard Cooper Sands. Richard was born on 1 Jun 1948. They had four children: Derek Cooper, Fiona Ursula, Juanita Rose and Linda Maree. 6-Derek Cooper Sands was born on 9 Jan 1974. 6-Fiona Ursula Sands was born on 9 Jan 1974. 6-Juanita Rose Sands was born on 20 Mar 1978. 6-Linda Maree Sands was born on 26 Apr 1979. 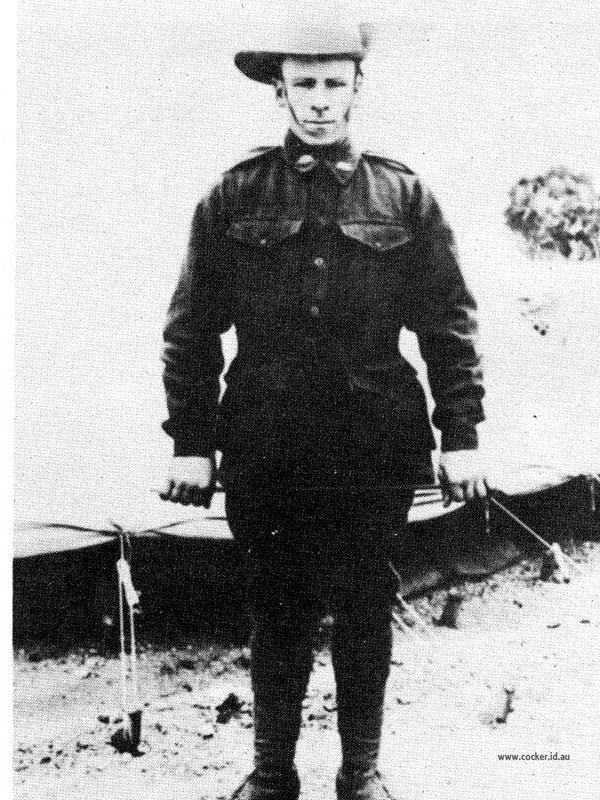 4-Leonard William Goss was born on 20 Jan 1921, died on 30 Jun 1942 at age 21, and was buried in Jun 1942 in Toogoolawah Cemetery, Queensland. He served in the Second World War. 4-Robert Walter Goss was born on 21 Jun 1922. Robert married Elizabeth McGowen. Elizabeth was born on 28 Jun 1928. 4-Norman Henry Goss was born on 3 Nov 1923 and died on 4 Oct 1986 at age 62. He served in the Second World War. Norman married Elizabeth Maude Pugh. Elizabeth was born on 13 Apr 1926 in Biralee and died on 24 Nov 1984 at age 58. They had nine children: Margaret, Norma Doreen, Peter William, Neil Henry, John Michael, Suzanne Elizabeth, Danny Walter, Garry Lenard and Ian Walter. 5-Margaret Goss was born on 28 May 1945. Margaret married Desmond Street. Desmond was born on 22 Nov 1941. They had four children: Tania, Leanne, Sharon and Craig. 6-Tania Street was born on 23 Dec 1964. 6-Leanne Street was born on 24 Dec 1965. 6-Sharon Street was born on 13 Sep 1967. 6-Craig Street was born on 14 Mar 1970. 5-Norma Doreen Goss was born on 9 Mar 1947. Norma married Donald Field. They had three children: Danelle Maud, Tina Lizette and Don Charles. 6-Danelle Maud Field was born on 16 Dec 1970. 6-Tina Lizette Field was born on 16 Dec 1970. 6-Don Charles Field was born on 7 Apr 1972. 5-Peter William Goss was born on 9 Dec 1948. Peter married Rosemary Ann Edwards. Rosemary was born on 14 Sep 1943. They had two children: Adam Troy and Timothy Scott. 6-Adam Troy Goss was born on 23 Mar 1980. 6-Timothy Scott Goss was born on 19 May 1981 and died on 30 May 1981. 5-Neil Henry Goss was born on 11 Aug 1950. Neil married Gaylene Ruth Saunders. Gaylene was born on 8 Mar 1951. They had three children: Maurice Andrew, Macharla Ruth and Brett Douglas. 6-Maurice Andrew Goss was born on 27 Feb 1972. 6-Macharla Ruth Goss was born on 5 Apr 1974. 6-Brett Douglas Goss was born on 14 Jul 1975. 5-John Michael Goss. John married Vicki Richardson. They had three children: Melissa, Kristi and Justin. 5-Suzanne Elizabeth Goss was born on 21 Mar 1952. Suzanne married Arthur Thomas Roberts. Arthur was born on 13 Aug 1938. They had three children: Katrin Peta, Debbie Susan and Jennifer Marie. 6-Katrin Peta Roberts was born on 28 Apr 1971. 6-Debbie Susan Roberts was born on 11 Jul 1972. 6-Jennifer Marie Roberts was born on 3 Nov 1974. 5-Danny Walter Goss was born in 1957 and died on 14 Nov 1968 at age 11. 5-Garry Lenard Goss was born on 10 Jul 1961. Garry married Janice Carol Smith. Janice was born on 27 Mar 1959. They had two children: Shawn John Smith and Katie Marie Elizabeth. 6-Shawn John Smith Goss was born on 3 May 1977. 6-Katie Marie Elizabeth Goss was born on 3 Jul 1983. 5-Ian Walter Goss was born on 7 Sep 1969. 4-Roy Goss was born on 28 May 1925 and died on 13 Jun 1961 at age 36. Roy married Tessa Wells. Tessa was born on 18 Nov 1921. They had three children: Glen Michael, Garth Milton and Shallon. 5-Glen Michael Goss was born on 3 Sep 1950. 5-Garth Milton Goss was born on 9 Dec 1952. Garth married Vicki Ruth Bawden. Vicki was born on 18 Sep 1955. They had three children: Sally Ann, Kylie Louise and Luke Adam. 6-Sally Ann Goss was born on 1 Oct 1977. 6-Kylie Louise Goss was born on 5 Nov 1979. 6-Luke Adam Goss was born on 27 May 1982. 5-Shallon Goss was born on 12 Aug 1956. 4-Charles Goss was born on 23 Jul 1927. Charles married Elaine Frances Gooch. Elaine was born on 23 May 1934. They had four children: Marie Elaine, Craig Charles, Jane Kathryn and Catherine Susan. 5-Marie Elaine Goss was born on 12 Feb 1957. Marie married Stephen Kenneth Curry. Stephen was born on 3 Jan 1954. They had two children: Christine Marie and Lisa Nicole. 6-Christine Marie Curry was born on 5 Apr 1975. 6-Lisa Nicole Curry was born on 3 Jul 1976. 5-Craig Charles Goss was born on 5 May 1962. 5-Jane Kathryn Goss was born on 3 Mar 1966. 5-Catherine Susan Goss was born on 22 Mar 1968. 4-Walter Ronald Goss was born on 10 May 1929. Walter married Ebstein Viola Jean Spinks. Ebstein was born on 5 Nov 1925. 4-Alice Goss was born on 19 Jun 1932. Alice married Allan Herbert Carpenter. Allan was born on 18 Jun 1929. They had eight children: Phillip Allan, Garry William, Rodney Charles Henry, Judith Ann, Wendy Lee, Graeme John, Michelle Joy and Jacquiline Mary. 5-Phillip Allan Carpenter was born on 22 Dec 1952. Phillip married Veronica Mary O'Connor. Veronica was born on 27 Jan 1960. They had one son: Shane Allan. 6-Shane Allan Carpenter was born on 3 Apr 1984. 5-Garry William Carpenter was born on 23 Feb 1954. Garry married Merran Elizabeth McDonald. Merran was born on 15 Sep 1954. They had one son: Troy Daniel. 6-Troy Daniel Carpenter was born on 25 Sep 1984. 5-Rodney Charles Henry Carpenter was born on 16 Aug 1957. 5-Judith Ann Carpenter was born on 20 Jan 1959. 5-Wendy Lee Carpenter was born on 23 Jan 1961. 5-Graeme John Carpenter was born on 27 Feb 1962. Graeme married Brenda Joy Downie. Brenda was born on 2 May 1962. They had two children: Sarah Jane and Bradley John. 6-Sarah Jane Carpenter was born on 8 Oct 1983. 6-Bradley John Carpenter was born on 30 Dec 1984. 5-Michelle Joy Carpenter was born on 4 Jun 1963. Michelle married Michael John Goodwin. Michael was born on 9 Jan 1964. They had one son: Allan John. 6-Allan John Goodwin was born on 13 May 1984. 5-Jacquiline Mary Carpenter was born on 14 Oct 1964. Jacquiline married Allan Wayne Whatman. Allan was born on 12 Dec 1962. 4-Joseph Goss was born on 19 Apr 1934. Joseph married his first cousin June Margaret Goss, daughter of Alfred James Goss and Elsie Jane Medcraft, on 28 Nov 1954 in Melbourne, Victoria. June was born on 27 Oct 1934 in Barrington, Tasmania. They had six children: Sharon Dianne, Jo-Anne, Daniel Leonard, Darren James, Warren Joseph and Dale Kenneth. 5-Sharon Dianne Goss was born on 25 Apr 1956. Sharon married Paul Dennis O'Shannesy. Paul was born on 4 Apr 1954. They had two children: Aaron James and Bree Jade. 6-Aaron James O'Shannesy was born on 5 Jan 1982. 6-Bree Jade O'Shannesy was born on 5 Jan 1982. 5-Jo-Anne Goss was born on 19 Apr 1957. Jo-Anne married Jeffrey Fryer on 30 Apr 1977 in Albert Park, Melbourne. Jeffrey was born on 29 Jun 1954 in Kyneton, Victoria. They had three children: Nicolle Louisa, Amy Jane and Emily Jane. 6-Nicolle Louisa Fryer was born on 21 Jan 1973. 6-Amy Jane Fryer was born on 13 Feb 1979. 6-Emily Jane Fryer was born on 25 Jan 1985. 5-Daniel Leonard Goss was born on 7 Mar 1958 in Melbourne, Victoria. Daniel married Lynette Mavis Edwards. Lynette was born on 16 Jul 1965. They had two children: Jason Warren and Dale Joseph. 6-Jason Warren Goss was born on 22 Apr 1984. 6-Dale Joseph Goss was born on 5 May 1985. 5-Darren James Goss was born on 15 Dec 1963 in Melbourne, Victoria and died on 25 Aug 1984 at age 20. 5-Warren Joseph Goss was born on 12 May 1967 in Melbourne, Victoria. Warren married Lisa Michelle. They had one son: Dale Kenneth Joseph. 6-Dale Kenneth Joseph Goss was born on 8 May 1985. 5-Dale Kenneth Goss was born on 8 May 1985. 4-Patrick James Goss was born on 17 Mar 1936. Patrick married Violet Ann. Violet was born on 1 May 1934. They had two children: Philip Leigh and Christopher James. 5-Philip Leigh Goss was born on 21 Aug 1955. 5-Christopher James Goss was born on 24 Mar 1962. Patrick next married Myra June. Myra was born on 18 May 1940. 4-Daphne Joyce Goss was born on 2 Nov 1938. Daphne married Richard Maxwell Heirseman. Richard was born on 10 Jun 1922. 4-Bernard Samuel Graham Goss was born on 6 Jan 1940. 4-Henry Herbert Goss was born on 17 Nov 1941. Henry married Judith Farrell. Judith was born on 8 Sep 1945. They had three children: Tony Bruce, Helen and Colleen. 5-Tony Bruce Goss was born on 4 Dec 1964. 5-Helen Goss was born on 31 Jan 1966. 5-Colleen Goss was born on 5 Apr 1968. 4-Maxwell John Goss was born on 26 Oct 1943. Maxwell married his first cousin Margaret Anne Goss, daughter of Arthur Ernest Goss and Minnie Coral Crack. Margaret was born on 31 Aug 1945. They had one daughter: Shelley Anne. 4-Allen Leonard Goss was born on 10 Jan 1945 and died in 2008 at age 63. Allen married Judith Farrell on 10 Dec 1982. Judith was born on 8 Sep 1945. They had one daughter: Jodi Ann.